Here we go again… Facebook has changed the profile page again and decided to roll it out on 60 minutes tonight. The profile will be rolled out slowly to users but you can get it immediately by going here. The changes are mostly minor with Facbeook but the most note-able visual change being the replacement of Facebook Tabs with a small menu on the Left Nav. 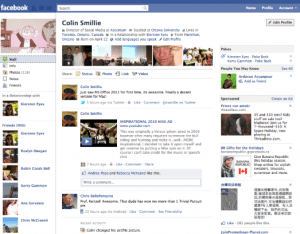 The menu includes all the pre-defined Facebook components including Wall, Info, Photos, Notes and Posts. There is no option to add other menu items or areas. A “jumble” of personal information is now included at the top of the below the user name, its not overly well formatted and the order seems to be clear. The jumble seems to default to current job & employer, most recent education, current location, relationship status and partner, home down, birthday. I’ve also seen the Jumble show language(s) spoken so it might be related to the most recent changes to your profile. The top of the profile now includes a 5 photo banner with your most recent tagged photos. Photos can easily be removed/hidden from this banner section. The Facebook profile data has also been updated to allow users to interests and activities from pre-defined Facebook Pages. For example selecting “Rowing” or “Swimming” defaults to Facebook Page for these activities. One small change is that you can select “with who” for many sports and activities. This adds a nice social component to these pages but its not clear how to user these community pages effectively. The other major change is the addition of spoken language to your Facebook profile. As someone who speaks a little French and even less Japanese it fun to enable these as languages and notice how my Facebook advertising experience changed almost immediately. You can even see a “Japanese ad” on my profile snap shot. The new profile clearly has some interesting new features but its also very focused on getting users to self-select their own interests with the hope that this will provide better advertising targeting. These advertising units are controlled exclusively by Facebook. There is NO ability for third-party Facebook applications or Facebook Pages to create with a user’s profile pages. Gone are Profile Boxes, Boxes Tab and Application Tabs. Next Next post: Skype Reliability?